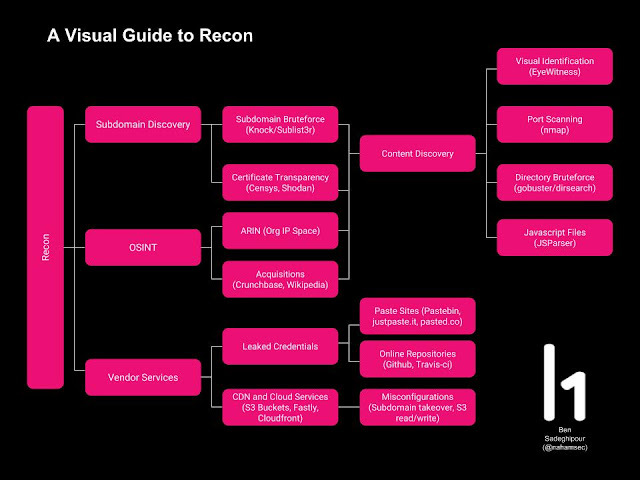 ReconUI is a simple web application that combines different recon methods to find attack surface and identify assets of the in-scope targets. 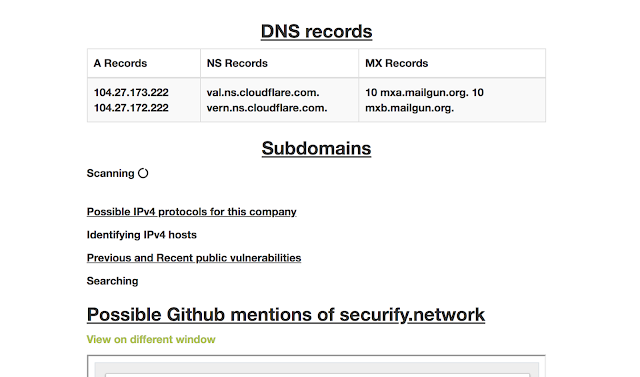 When you are given a scope like *.domain.com in bug bounty / vulnerability disclosure policies, it gives you a chance to find vulnerabilities in as many targets as possible. While that has its advantages, it also has its own disadvantages. Just for an example lets take yahoo.com. Yahoo's bug bounty accepts any vulnerability under *.yahoo.com. 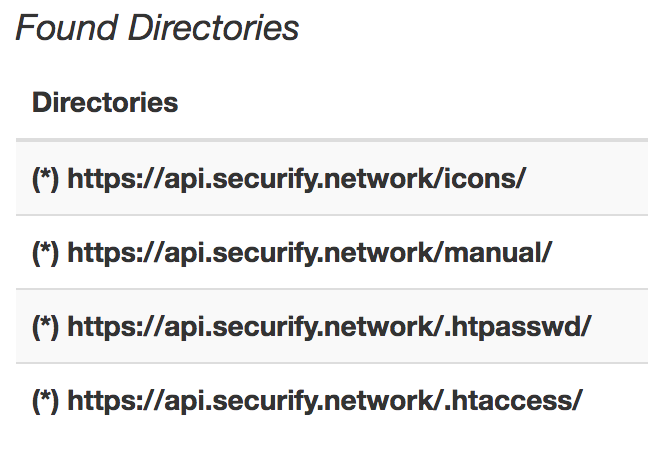 When you start looking for bugs, you end up finding thousands of subdomains and end up getting confused on what you should look for or how you should target something. In those cases, recon tools become handy because you can let them do the hard work and help identify possible crucial assets. However, as we (the bug bounty community) grow, multiple tools are released on GitHub that we can use. Simply running each of these tools on every scan or opening multiple terminals (despite how cool it looks) can sometimes get tedious. Personally, even though I love terminals I hate running multiple tools and having multiple terminals. This is when ReconUI makes it easy. This pictures sums up what I usually do for the first hour of my bug bounty hunting in a fresh program. Instead of looking for low hanging fruits, I do recon for sometime and then use the results from that to focus on finding more severe vulnerabilities. With ReconUI, it allows to do both: finding low hanging fruits manually and leave the recon and assets identification to a scanner UI. 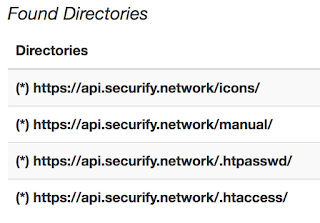 With this now, you can play around with the application and leave the web application to find subdomain takeovers, s3 buckets, port scans etc. There is no better way to explain the use case of this scanner than to practically show how each process works. For this blog, we are going to do recon on a "target". This target allegedly designs counter-hacking tools for governments and intelligence agencies. Here is the website: https://www.securify.network. So lets begin. There are certain thing to clear. First, for security reasons the scanner has a URL validation (you can remove it if you want but it is not recommended to do so). In order to run the scan you must have either a http or https before your valid url. Once you fill that, you need to paste in your Private Key (in the picture it says Beta users key). Private Key is given to you when the installer runs. Private key is used for your own security if you decide to host this UI in public facing website. Without the key, no one can run the scan. Next, once you accept the agreement located at: https://scan.bugbounty.site/agreement, you can run the scan. You can remove the agreement checkbox if you want but running any scans through this tool means that you follow the agreement at: https://scan.bugbounty.site/agreement. However, if there is any IPv4 found, its result will be showcased. One of the beauties of bug bounty platforms are private bug bounty programs. In these programs only selected few that meet requirements for example: impact/signal/reputation (HackerOne) or activity/accuracy/average severity (Bugcrowd) are asked to hack. Fresh programs who are just launching a bug bounty program sometimes have a lot of low hanging fruits one of the most common one being XSS (either stored xss or reflected XSS) vulnerabilities. Now, there are public websites that allow hackers to showcase their ability by XSSing any websites they want. While technically not legal because testing a website without permission is not considered ethical, most hackers tend to still contribute to this public database of vulnerabilities. One of such websites is openbugbounty.org. As a bug bounty hunter, if you get invited to a private program, researching that domain in openbugbounty.org might be helpful. Hackers who do not know that company X has a private program might still be reporting its XSS to OBB for fame and leaderboard. However, because you are invited to company X's private program, you can report the same XSS and get credit/bounty for it. ReconUI helps you do the same by querying openbugbounty.org and then looking for any publicly released XSS. Even a XSS that was reported three years ago and now is considered fix can help you understand how an app is built and sometimes you might just find a bypass to the fix. Now, after these basic recon comes the more critical part: subdomains, directory search and s3 bucket scanners. 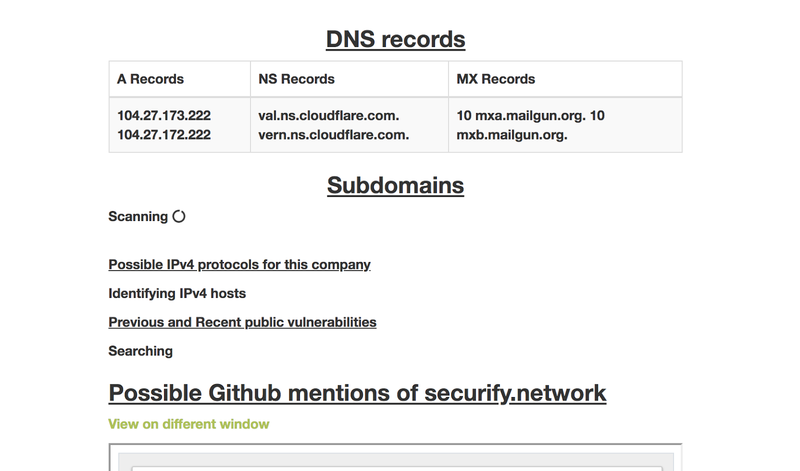 Subdomains open new doors of finding more severe vulnerabilities because sometimes they tend to be hosting critical part of an application (admin interface, CMS, internal login informations etc). 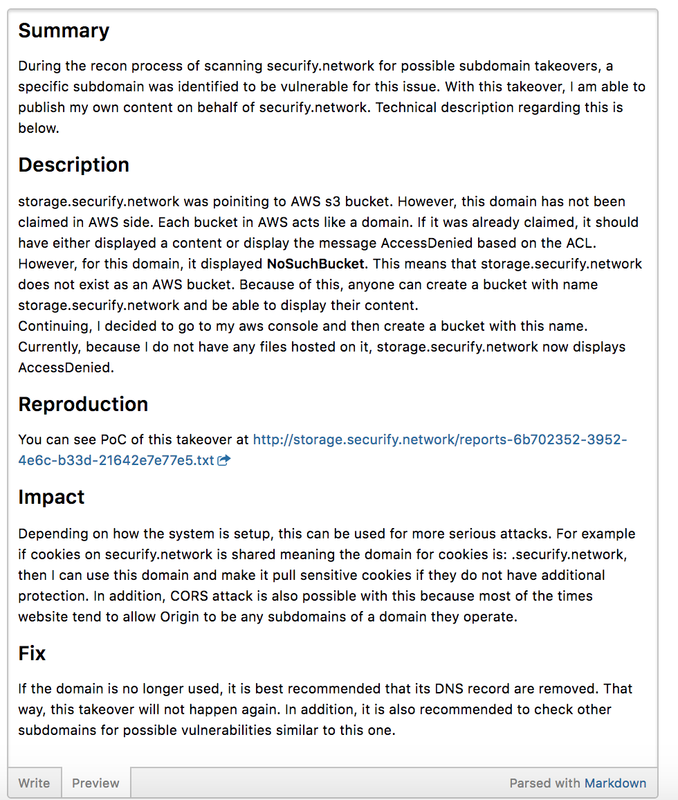 At the same time, some subdomains can still be vulnerable to subdomain takeover. 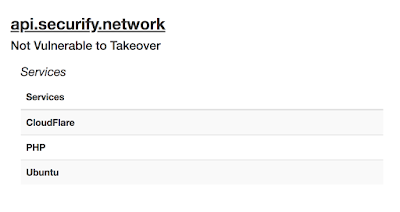 Subdomain takeover happens when a domain points to a non-existent domain in a third party service. Most common examples of subdomain takeovers are through Heroku, S3 Buckets, CloudFront, and GitHub. The same attack can also be done against a Heroku Subdomain Takeover. 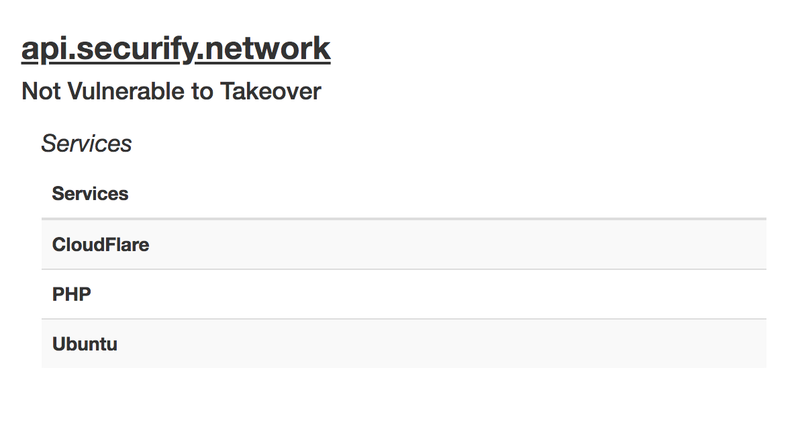 This is how to setup the Heroku auto-takeover. With a Heroku account that has credit card in place create an app (can be anything). Deploy the app to have some form of text with your takeover message. In the installer script when you first run it, put the app name when it asks for it. Each subdomain that is found by the scanner will go through a directory brute force. Any valid directories that is found (either a 200 or 403) will be presented to the user in a table format. This helps to find some basic vulnerabilities for example existence of a .git folder. Sometimes this can be used to find hidden directories that might have user confidential information for example user ID verification through driving licenses which are stored in local directories. In the end, this tool is still a work in progress and will have a lot of updates coming in near future with new tools and recon tricks for example finding leaked credentials directly without having to browse through series of searches. Additionally, there are some code fixes that will happen to make this more efficient and neat. I hope you like the tool and will have some success with it. If you have any feedbacks or suggestions please reach out to me at bugbountysite@gmail.com.